It is once again that time of the year when we foolishly try to convince ourselves that someone other than Kansas is going to win the Big 12. In one of the most ridiculous streaks at any level of any sport, the Jayhawks have earned at least a share of the Big 12 regular-season title in every season dating back to 2004-05. Even the New England Patriots failed to make the playoffs once during that time, and they don't have to deal with as much roster turnover on an annual basis as college basketball teams do. But Kansas has lost three of its last four games and is only 1-5 in true road contests this season. All of the Jayhawks' noteworthy wins have come by a single-digit margin. They are still going to make the NCAA tournament with plenty of room to spare, but this is arguably the worst they have been since 2000. There's no time like the present for someone to rise up and end the Jayhawks' Big 12 streak. What makes this year's top challenger to Kansas different from usual is that before the season began, Baylor was not expected to be good. Six weeks ago, we had already left the Bears for dead. Baylor narrowly missed the NCAA tournament last year and then lost all four of its leading scorers as departing seniors. Making matters worse, Tyson Jolly transferred in April, and Jake Lindsey—the projected starting point guard—was ruled out for the year following hip surgery in August. The only returning players who scored at least two buckets last season were role players King McClure, Tristan Clark and Mark Vital. Even with the additions of three solid transfers (Makai Mason, Mario Kegler and Devonte Bandoo) and two top-100 freshmen (Matthew Mayer and Jared Butler), growing pains were to be expected. And when Baylor lost its season opener to Texas Southern—a team the Bears had beaten by an average margin of 24.0 points over the previous four years—it seemed like things might be even worse than feared. Neither Mason nor Kegler was able to play against Texas Southern, so the roster was especially depleted. But there were problems even at full strength later. 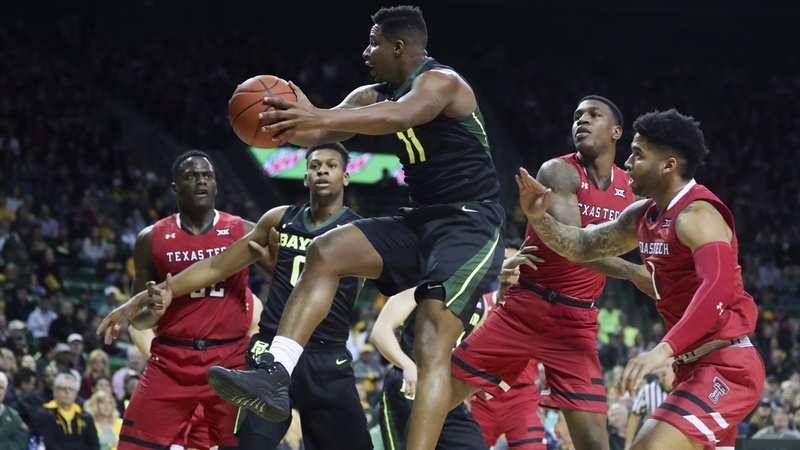 By mid-December, Baylor had added another terrible home loss to Stephen F. Austin and a disappointing road loss to Wichita State, and only one of its six wins (at Arizona) was anything close to impressive. When the Bears played Oregon on Dec. 21, they were ranked outside the top 70 on KenPom.com for the first time since the end of the 2010-11 season. Through 10 games, no rational person thought Baylor would make the NCAA tournament, let alone vie for the Big 12 title. But now that the Bears have played 20 games, there are only three teams in the country (Duke, Kansas and Michigan State) who entered play Tuesday with more Quadrant 1 wins. Suddenly, Baylor looks the part of a team that could put together a significant run in the NCAA tournament. Scott Drew has done one heck of a job with this Baylor team. Gonna be five straight wins — with tonight’s being a huge one at Oklahoma. Amazing aspect is that the Bears have done it all without Tristan Clark — who went down with a season-ending knee injury a few weeks ago. The Bears are tied with Kansas State atop the Big 12 standings—one game ahead of Kansas in the loss column—and they may well get to 9-2 in conference play before they face their next stiff test. Naturally, this begs the question: What the heck changed? How in the world did Baylor go from Quadrant 4 losses to teams from the SWAC and Southland conferences to winning at Oklahoma by 30 and scoring more points against Texas Tech than any other team (including Duke) has this season? The short answer is that head coach Scott Drew is a wizard who gets underappreciated on a yearly basis. The slightly longer answer is that the shooting guards are finally doing what they're supposed to do. Baylor's opponents are shooting better from the field in the past 10 games (42.5 percent) than they did in the first 10 (38.8 percent), and they are also committing 2.7 fewer fouls per game. Moreover, opponents are blocking 1.6 more shots per game over that span and are averaging 2.5 more assists, too. If anything, you'd think from that Baylor would be losing more games now. But the team's three-point shooting has improved drastically. Through 11 games, Baylor was shooting 27.9 percent from distance and averaging 69.3 points per game. In the four losses during that stretch, the Bears were a woeful 16-of-83 (19.3 percent) from downtown. Over the past nine games, though, Baylor is shooting 37.2 percent from deep and is scoring 76.3 points per contest. Most of the credit belongs to Bandoo and Butler. They were averaging a combined 1.5 made threes through 11 games. Bandoo was shooting 29.0 percent, but that was better than Butler's poor mark of 21.1 percent. But since Christmas, Bandoo is 14-of-30 (46.7 percent) and Butler is 18-of-42 (42.9 percent). Just like that, close losses to bad teams have become close wins (and the occasional blowout) against good teams. And while you always worry about hot streaks eventually fading, 37.2 percent is a sustainable rate of three-point success. Against D-I opponents, Baylor shot better than that in 2013-14, 2014-15 and 2015-16. The Bears struggled early while roles took shape and the new guys learned the offense, but they have scored at least 73 points in eight of their last nine games. It took nearly two months, but things finally clicked, and they have continued clicking through wins over Iowa State, Texas Tech, Oklahoma and Alabama. Even the two losses (at TCU, vs. Kansas) have been competitive, as each were decided by two possessions. Had the Bears shot 37.2 percent from three-point range in those games instead of 27.7 percent (13-of-47), we'd be talking about a 10-game winning streak. But before we go crowning Baylor as the 2019 Big 12 champions, we need to discuss the remaining schedule. The Bears already have three road wins in conference play, but they still need to play at Texas Tech, Iowa State, Kansas State and Kansas. The games against the Red Raiders and the Cyclones are back-to-back in mid-February, and the game against the Jayhawks is the regular-season finale. If Baylor and Kansas are tied for first place heading into that game, the atmosphere in Allen Fieldhouse is going to be unbelievable. It is always next to impossible for the road team to win in that building, but factor in the threat of the Big 12 streak ending, and Richter scales in other states might feel that one taking place. There's an even longer streak in play between Baylor and Kansas, too: In 14 tries since they joined the Big 12 in 1996-97, the Bears have never won a road game against the Jayhawks. It's hard to imagine they could finish ahead of Kansas without winning that head-to-head showdown on March 9. Since 1996-97, Kansas won 11 of its first 12 home games against Baylor by a double-digit margin, but the past two contests were decided by a combined margin of eight points. And when they met in Waco a few weeks ago, Baylor darn near erased a 20-point deficit in the final four minutes. The Bears won't be scared of the big bad Jayhawks. Not after all they went through to get to this point. Kansas fans figure to bookmark this so they can throw it in my face when the Jayhawks win the Big 12 by a multiple-game margin for the fifth time in the past six seasons, but this Baylor renaissance is more than just a feel-good story for January. If the Bears keep shooting at an above-average level, they could win a league title for the first time since winning the Southwest Conference en route to the 1950 Final Four.